In 2009, the Tri for Malawi was created to honor the scholars’ efforts and benefit AGE Africa’s scholarship fund. Now in its 10th year as AGE Africa’s largest annual fundraising event, the 2018 Tri for Malawi will take place will take place on Sunday, September 9th, 2018 as part of the Nation’s ESCAPE Triathlon in Washington, DC. Athletes will complete both the Sprint and Olympic distance triathlons and compete to raise $75,000. The Sprint and Olympic distance courses wind through Washington, DC’s monument corridor, in the shadow of the nation’s best known memorials and national treasures. The Course features a 1.5K (Olympic) or 750M (Sprint) swim in the Potomac River, a 40K (Olympic) or 26.5K (Sprint) bike course through DC, and a 10K (Olympic) or 5K (Sprint) run through Washington, DC’s historical landmarks with a spectacular finish! 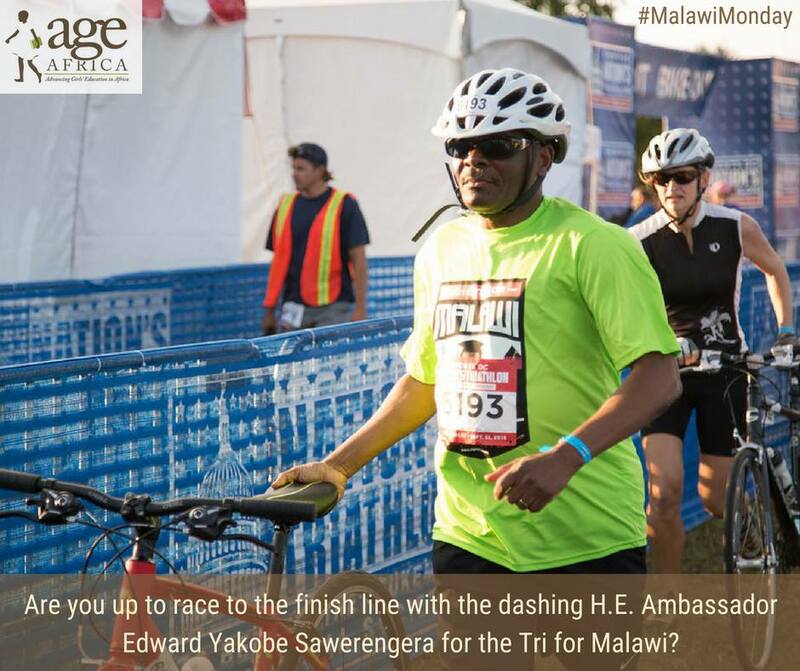 His Excellency Ambassador Edward Yakobe Sawerengera is competing in the 10th Annual Tri for Malawi! Are you up to racing to the finish line by his side? Join our team of triathletes or support our fundraising efforts today! For more information about the race, visithttps://ageafrica.org/triformalawi.